If you are like most of us, it is easy to hold onto things for later, just in case you will find some use for them. This is the perfect way to fill up every available space with, to put it nicely, junk. However, if you have been putting off decluttering until you have the time, this time may never come, unless you are moving house. This is the perfect time to say goodbye to items you have collected over the years that really should go. Get the exact size of the new space you will be moving into. Next, look at all the furniture you have and decide if they will fit in the new space without it being crammed. Look at the design and state of the furniture and consider whether it will be aesthetically pleasing in the new home. It may have sentimental value, but sometimes you should just hold on to the memories, not the item. Start packing for your move early, because if you leave it for the last minute, you are more likely to cram everything into the moving truck. If you start early, you are better able to differentiate between what you can donate and what you can throw away. – Do I use this? – Will I ever need this? – Is it working? If not, is it better to replace it? You reduce the stress that normally comes with moving, especially if you have a family. When you take time to declutter before the move, you don’t have to worry that you are leaving anything behind. Plus, clutter in your home is stress-inducing. Not only does it make the home less relaxing, it is difficult to find things when you need them. Remember that you pay by the size for the moving truck you rent. Why pay to move items that you will not need? You can make some money by selling the stuff you will not be taking with you by having a garage sale. Who doesn’t want a little extra cash? 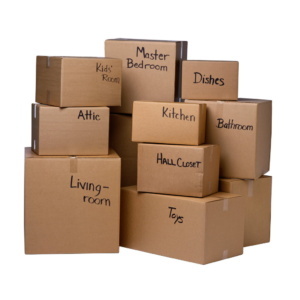 You may even find that your moving company also offers long and short term storage options. This way, you can store some of the items you are not taking to your new home until you can properly cull them. This means less ‘junk’ is taken to your new space. This also gives you enough time to decide if you truly need the items you have in storage. Since moving house can be a stressful situation in itself, you need to do everything possible to make it easier. Letting go of a lifetime of memories is difficult, but look at it as a brand new start elsewhere – an adventure. We didn’t say it would be easy, but taking it slowly by starting early will give you time to enjoy handling some items one last time. It also gives you an opportunity to pass on a beloved piece of furniture to a special family member who will get as much pleasure out of it as you did.
" To provide and maintain first-class moving service with greatest value for our customers and sound business practices for our company. "